Este módulo describe la estructura y composición de la atmósfera, la relación entre la radiación solar y la Tierra y el equilibrio térmico de nuestro planeta, los elementos meteorológicos empleados para describir la atmósfera, el efecto invernadero y los desfases de temperatura que se observan a nivel diario y estacional. El contenido presenta los conceptos de presión, calentamiento atmosférico y temperatura, y brinda la base para comprender los temas de meteorología que se exploran con mayor detalle en otros módulos del curso intermedio sobre el comportamiento de los incendios forestales (Intermediate Wildland Fire Behavior Course). Again if you get a question wrong, you are not shown the correct answer.... Not a good way to learn...! Wish it was a bit more challenging and informative. That said, it was well organized. Well presented, great visual aids. This course helped explain a lot about the weather, patterns, and what to look for on hot dry days. This was a good, informative module. I learned the subjects with relative ease and found note-taking to be relatively easy alongside the vocalized slides. this lesson helped me learn so much. it was much more effective than reading the bok on my own and attending lectures. The lesson was pretty easy to grasp and understand. Highly recommend unit to all wild land firefighters. You guys have created something clear and useful. Thank you! It's concise enough to watch once and capture the information. Thank you for the multiple ways in which the information is presented (visually, aurally, and textually). As a dispatcher, this course helped me better understand the importance of keeping firefighters appraised of the weather. Information is planed out and given in a way that it is easy to understand. Good lesson. Great visual aides. Good information that is relayed in a manner that is easy to understand in simple language. THIS WAS VERY INFORMATIVE AND INTERESTING. Great lesson. Really help improve my understanding in the subject. Great educational information to grasp how weather can effect the daily life that could be used in any given situation. While it won't reveal why your game was rained out on any given day, this module addresses many of the other "why" and "how" questions about weather. Weather is super critical to safe wild land firefighting, as well as safe and effective prescribe burning. This stuff can save you life. Some new concepts (so definitely don't zone out) but the review questions along the way help nail down the terminology and definitions. I would like to see questions I answered incorrectly with correct answers displayed to help me further study concepts I missed. Learned new stuff about weather! This lesson was particularly interesting to me. I like how these lessons are designed. My background in geology and other sciences ties in with a lot of this. So I appreciate how these lessons are geared to inform you in a scientific way. I usually don't enjoy learning things like this. That changed with this lesson. the information, graphics and quiz questions are wildly contradicting. please go through and correct this issue, the course is confusing, misleading and down right incorrect. Good course, however some of the quiz terminology did not match the course terminology. If you don't have a background knowledge of areas and word use, it can seem confusing. Some topics and vocabulary were a bit out of our scope as firemen, but a it helped gain good overall understanding. i even learned some new vocab! Albedo...who knew?! straight forward content, easy and long. Lots of the content you have probobly already heard or learned else where. I knew most of this from Geography class. The format of several sections were a little bit backward. In particular, the explanation of a graph came at the end of the lesson rather than before, making it difficult for one could understand and follow the lesson. I found myself having to repeat multiple sections, multiple times each, in order to somewhat retain what was being taught. More engaging experience / less monotonous lecture would probably help students retain more of the information. This section did give me a basic understanding of the weather processes, things that I definitely were not aware of. Pretty quick and straight forward! Simple way of learning! Pay close attention to the images and diagrams, they help tons! Don't just focus on the words written on the page. It helps review the lecture material in class. Some of the descriptions used were difficult to understand. Thank goodness for the atmosphere! Brief and concise. 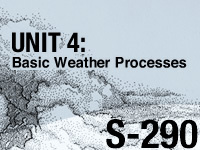 I have no background in meteorology but learned a lot from this module in such a short time. A lot of the videos were monotone and not interactive. The photo quality of the interactive activities were small and confusing. Too technical, more detail than necessary for this field. Before this session I only knew basic of weather behavior and learn a lot more about our atmosphere system and sun. great module, reallu teaches you a lot and breaks everything down nicely for you to understand. good module, except the cloud cover is non specific on test as the earth stays warm during day and nite with cloud cover. This is a good module. It only gives a very basic look at weather, as the name says, and is very easy to understand. The simplicity and clarity of the images, animations and interactive components make this activity perfect for use with students in the lower secondary classroom or for whom English is not their first language. Great stuff MetEd! very informative - thank you, MetEd! Excellant course very informative. Would recommend course to all Fire Fighters. describir los desfases de temperatura que se observan a nivel diario y estacional y su efecto en el comportamiento de los incendios forestales.